President Akufo Addo will later today [Wednesday], inspect ongoing works on the foot bridges on the Madina-Adentan stretch of the N4 Highway. The non-completion of the bridges over the past decade has resulted in the death of many pedestrians leading to a civil protest that left some persons injured from police actions. Days after the mass protest, some construction workers were seen erecting hoardings for work on the footbridge to begin. The President is expected to meet leaders of the residents’ association and interact with them on the development. The inspection of the on-going works forms part of the President’s tour of the Greater Accra Region which enters day two today. Also on the president’s itinerary today is the commissioning of the newly constructed accident and burns center at the Korle-Bu Teaching Hospital, and the sod-cutting ceremony for the construction of the James Town Fishing Harbour. Akufo-Addo is also expected to meet and interact with spare parts dealers at Abossey Okine. 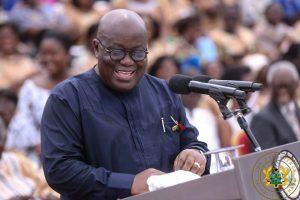 The post Akufo-Addo inspects Madina-Adenta footbridge project today appeared first on Citi Newsroom.